Crossing Newfoundland by ATV: What is the Newfoundland T'Railway? Welcome to the Crossing Newfoundland by ATV Blog. Everything you need to know to do this trip here. Check out my new website - www.crossingnewfoundlandbyatv.com. It has all the same information as this blog plus some new tips and a new look. You can still use this blog if you like as I will leave it up. 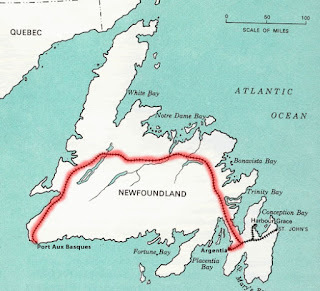 You may also find handy Newfoundland Trail information and discussions on my Crossing Newfoundland by ATV FACEBOOK page. Also, there are dozens of Newfoundland ATV videos on my EastCoastATV YouTube channel if you'd like to check them out to get a feel for what it's like to ATV over there. Click to download GPS Tracks and my Day by Day Guide. The T'Railway is probably the most unique 883 kilometers of ATV trail anywhere and it spans one of the most scenic provinces in Canada. 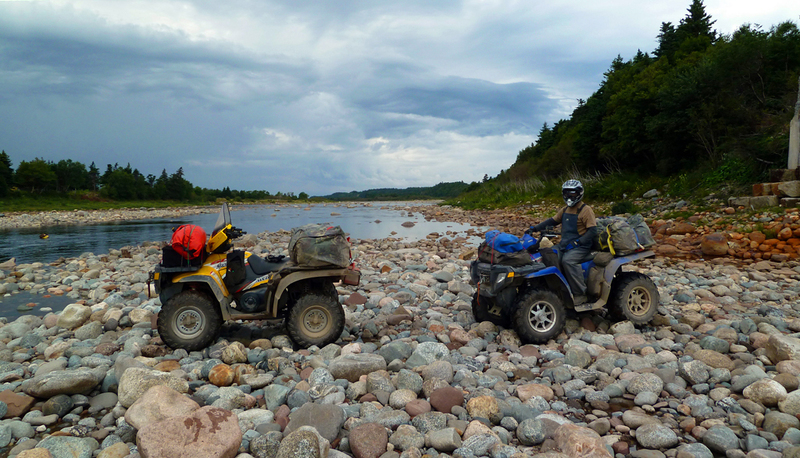 The Newfoundland ATV Trip packs in enough scenery to impress even the most enthusiastic ATV adventure seekers. Cliff-side ocean views, mountains, flat lands, rivers, lakes, beaches, waterfalls and wildlife are some of what you can expect to see in one week from coast to coast. If you enjoy ATV riding, beautiful scenery and friendly people... this trip is for you! There are 14 pages on this site, five of which are photos and videos from different trips I've done. Further down this page is an overview of what is contained in the blog. Read through it to get an idea of what posts might help you most. If you've never done this trip before, you'll probably just want to read them all. Don't forget to check out the amazing pictures and videos! After hearing it was possible to cross NL by ATV I searched the Internet looking for information but I couldn't find anything. So, friends and I did the trip on our own and winged it. Since then, I've done the trip several times. I documented everything I learned and posted it on this blog so others could enjoy it. I'm glad to learn that many people have completed the trip because they found this information. My goal was to help people do this trip without a guide. Even if you do use a guide, this site will give you a good idea of what you can expect to see. If you like what you see, tell your friends. Thanks! In 1988 the train stopped running, the tracks were removed the trail was essentially abandoned. In 1997 the scenic trail was re-purposed and renamed The T'Railway Provincial Park. Thousands of ATV enthusiasts across Canada and the USA have done the Newfoundland ATV Tour and some return annually, like me! This GPS track covers all the different trips I've done from 2013 until 2016. FIRST TIME ON THE BLOG? On the fence about hiring a guide or going by yourself? Read my thoughts. You'll ride up to 1000 km (600 miles) in a week. Prepare. Camping or Motels? Either way I'll tell you what you may want to take. Warning - looking at the pictures and videos from our trips will make you want to go! Helpful details you'll want to know for each day of the trip. Simple steps to get you started on planning your trip! Get a feel for the trail with pictures and videos. Check out the 2013 trip pictures too, it includes a lot of daily details. The T'Railway Provincial Park official website. Look for the handy kilometer guide, print a copy and take it with you. What do I need to legally travel the trail? You have to wear a helmet, be insured, and have current vehicle plates and registration in your home area. Also, Newfoundland Law requires you to have a fire extinguisher. One per group is probably fine. This is an invaluable tool! I use it all the time as a reference. You can click on each track and each picture and information will popup in a window. Zoom in to the start of the trail on the East Coast and follow the trail as it works it way West. You'll see where we stop for gas, motels, camping, food and more. You can click on any of the icons for more information. Thanks for information about the ATV trail! I can barely find any information about it elsewhere! You're welcome. I hope it helps you out. Great trip log. Great photos. I have been wanting to do this trip for some time now. I am wondering if you have any thoughts about how this might go on a KLR 650 dual sport instead of a quad runner.? I think you can do it. Check out this site, you may find it helpful. did you use the Buchans trail thats in orange, using ATV/UTV? I have not personally. I know a person that used that trail about two weeks ago and they sent me the GPS track. I just recently added to to the map. just trying to get your full trip GPX file to load into Garmin Basecamp but cant figure it out. I think the easiest way is to drag and drop it from whatever folder you have the gps stored in. You could also create a new folder in BaseCamp. Click that folder to select it and then click File>Import into folder. Try that. See if it works. So I got your 2013 route up but it doesn't show all the stops you made. ie food and stuff..still great info. Everything you want to see is on the Google Map that is on this site. Click the "Overall Trip Map" link to open it. You can zoom in very close to each icon and click on each one for more information. Email me at patrickryan57@hotmail.com and I can send you the GPS track.